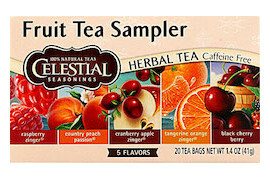 Celestial packed as much lively fruit flavor into their Fruit Tea Sampler as their box would hold. From the sweet, simple pleasures of Black Cherry Berry to the sophisticated taste of Wild Berry Zinger, each of these luscious herbal blends is satisfying when hot and invigorating over ice. Ingredients: Black Cherry Berry: Hibiscus, rosehips, roasted chicory root, blackberry leaves, hawthorn berries, natural black cherry flavor with other natural flavors, chamomile flowers, and sweet cherries. Contains soy lecithin. Country Peach Passion: Rosehips, hibiscus, orange peel, roasted chicory root, chamomile flowers, blackberry leaves, natural peach flavor with other natural flavors, natural passionfruit flavor, peaches, and citric acid. Contains soy lecithin. Cranberry Apple Zinger: Hibiscus, cinnamon, roasted chicory root, natural flavors, chamomile flowers, blackberry leaves, cranberries, and apples. Contains soy lecithin. Raspberry Zinger: Hibiscus, rosehips, roasted chicory root, blackberry leaves, orange peel, natural raspberry flavor with other natural flavors, lemon grass, raspberries, raspberry leaves, and citric acid. Contains soy lecithin. Tangerine Orange Zinger: Hibiscus, rosehips, blackberry leaves, hawthorn berries, orange peel, natural tangerine flavor and other natural flavors. Contains soy lecithin.